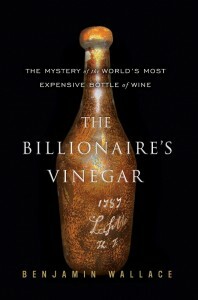 The Billionare’s Vinegar | We are what we eat! What a great book for anyone interested in vintage wine – and when I say vintage, I mean the same swill of Jefferson’s season. A true story with an epic cast of characters: penetrating palates, billionaire imbibers and phony parvenus. The tale takes us to Christie’s wine auctions and Bordeaux Chateaux, along with some well researched insight on vintage collecting. Although its almost hard to believe that such eccentric and bold characters exist in the world of food and wine-counterfeiting and fraud are more typically associated with banks than food and drink-the pugnacious doubt that haunts a small circle of wine collectors illustrates that for these people, making money is second only to experiencing the world’s greatest wines. For those of us who scout our local wine shop more often than bid at Christie’s for historical wines, the romantic and dangerous adventure surrounding a single, famous bottle of wine makes for a rollicking good read.